At first inspired, then disgusted, by Punk's quasi-Leftist posturing, Billy Bragg looked back to protest songsters such as Woodie Guthrie and Phil Ochs for inspiration. Picking up where Ochs left off, Bragg's recordings juxtapose intelligent social critique and tight, resonant melodies. Though in most cases he gives equal weight to these priorities, Bragg's hand is often forced by his radical political sentiments -- something which has guaranteed him a mixed reception in his native England and relative obscurity in the U.S. Even the recent collaboration with Wilco seems to have made precious little impact on his stateside reception. Undaunted, Bragg has continued sculpting poetic songs from a rare alloy of politics and lyricism. 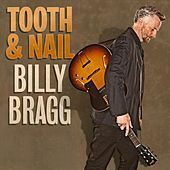 Sometimes joined by a band, but usually opting to go it alone with his guitar, Bragg's performances and recordings have helped preserve folk's capacity for social and political relevance.